New Delhi, Dec 24 (IANS) This family is actually 'yamla pagla deewana' where the youngest son Bobby Deol is still treated as a buddy by dad Dharmendra, while his elder brother Sunny treats him as his third son. "Bhaiya (Sunny Deol) treats me like his son. He looks after me and always says I don't have two sons, I have three sons and you are the third one," Bobby, who will turn 44 in January next year, told IANS. "He is like that. He is very caring. He's very loving. He's like a father and would do everything to keep everybody happy in the house," he added. Sunny, 54, has two sons Karan, 19, and Rajvir, 16, with wife Pooja. As for Dharmendra, Bobby says he is no less than a friend. "In real life, I definitely respect my dad a lot. He is someone who keeps entertaining everyone at home. It's fun being at home with him. He has a great sense of humour and he often comes up with his jokes and makes us laugh." After the success of 2007 "Apne", the trio of Sunny, Bobby and Dharmendra is once again returning to the big screen to tickle the funny bones of the audience as three crazy guys in the aptly titled "Yamla Pagla Deewana". The movie also marks Dharmendra's 50 years in the industry. And Bobby says the film is a celebration of his dad's achievements. 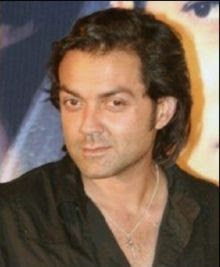 Bobby started his career with 1995 "Barsaat" and went on to do films like "Gupt: The Hidden Truth", "Soldier", "Humraaz", "Nanhe Jaisalmer" and "Dostana". Bobby is not a party hopper any more and prefers to spend time with friends and family. "I prefer to stay away from the limelight. I am more of a home boy. I love being at home with my friends and my family. I used to go out a lot earlier, but it is something that drains you out. At this moment, I don't feel like doing those things," he said. "I spend time at home with my kids. Moreover, I live in a joint family where all of us including my chacha (uncle) are together, so I love being at home," he added. While both Sunny and Bobby have made a mark in mainstream cinema, another Deol scion Abhay is making waves in offbeat films with his outstanding performances in movies like "Dev D" and "Oye Lucky Lucky Oye". Bobby is proud of his cousin's success and is looking forward to working with him in future. "I am so proud of him (Abhay), he's doing so well. If he wasn't an actor, he would have been a lawyer because he loves to argue and I seriously can't do that. He has a mind of his own. He is very fixed about his decisions and it has worked for him. He's a great actor who can do romance, comedy, everything," he said. So when could fans see all the four Deols together in a film? "It is difficult to come across scripts that could incorporate all of us. It took so many years for me, dad and bhaiya to come in 'Apne'. To get all four of us together is not easy. We can't take any script and come out with a film. It has to be a script that we enjoy. Definitely in future you would see Abhay and me working together," he said. Bobby is currently busy with two films - Anees Bazmi's "Thank You" and Abbas Mastan's "Players" - and is open to doing offbeat movies. "Every time you do a film, the hangover lingers and you look forward to doing it because you have been through that process. But as an actor you want to do something different. I would love to do an offbeat film if I come across something that suits me and I suit the subject," he said.